Our Price: $39.95 Ships in 1 day. Hard Cover, 176 pages, 8.5 x 11. Following the end of Prohibition on April 7, 1933, U.S. federal and state governments set specific requirements regarding the identification of beer being dispensed from taps in taverns. The tap, faucet, or other delivery system had to be clearly marked with the name of the beer being dispensed, leading to the development of a tap marker industry. Through the mid-1950s, a style of tap marker nicknamed the "ball" knob was widely used. Now highly collectible, more than 2000 ball knobs are presented in full color in this comprehensive, hard cover book. The knobs represent 1000 brands of beer manufactured by over 675 breweries and are classified by state in which the brewery was located. 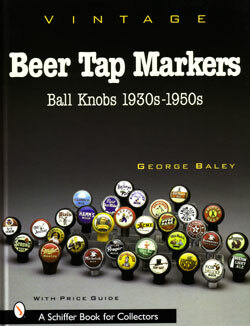 Includes valuable information on the history of ball knobs, dates of use, grading, pricing, manufacturers, and a detailed index of breweries. A wonderful addition to every breweriana collector's library! Another great breweriana book from Schiffer Publishing. » See more books on breweriana.